SOLD OUT! In letters written home to his wife Katherine while serving in the Revolutionary War, General Edward Hand would address her as “My Dearest Kitty.” Later, as the mistress of Rock Ford Plantation, “Kitty Hand” hosted many elegant teas for family and friends. 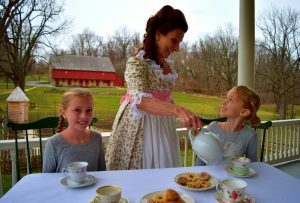 During “Tea with Kitty Hand,” children and their families will experience a taste of an 18th century tea party with Kitty Hand. Children and their families will participate in activities such as “talking with fans,” playing a memory game, finding objects in the mansion, and exploring the aromas of teas along with a few surprises. “Mrs. Hand” will serve tea and cookies to her guests. This event will be held rain or shine on the Rock Ford porch and inside the mansion and the barn. In the event of rain, guests are asked to bring umbrellas as they will be walking from the barn to the house. This fun and informative children’s event is open to boys and girls and recommended for children ages 5-12. Reservations are required for this event. The charge is $8 per person. The deadline for reservations is Friday, April 20. To make a reservation, please call the Rock Ford office at 717-392-7223 (Monday-Friday, 10 am to 4 pm).